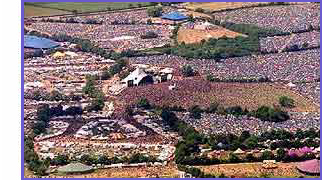 Glastonbury Forum: U2, Coldplay & Beyonce Rumoured? Topic: U2, Coldplay & Beyonce Rumoured? U2, Coldplay & Beyonce Rumoured? Posts: 1434 Beyonce and U2 are reportedly confirmed to join Coldplay as headliners of this year's Glastonbury festival. U2 have long-since been rumoured to be playing this year's event, having cancelled their slot last year due to singer Bono having surgery. Organiser Michael Eavis previously said he'd asked the band to play at the 2011 festival. Eavis had also said of another 2011 headliner: "There's an American artist that I’ve been wanting to have for years and yonks and yonks and yonks." Now gossip website Holymoly.com has claimed that U2 and Beyonce are both booked, with Coldplay already revealed as headliners. Beyonce visited the festival in 2008, when her husband Jay-Z headlined, but she has never performed at the event. Glastonbury 2011 takes place at Worthy Farm, Pilton. Billed music takes place on June 24-26, with the site opening on June 22. Last year Gorillaz replaced U2 as headliners, with Muse and Stevie Wonder also playing headline slots.